Please note that a Development Application for 146 Watson Road and 121 Gregory St, Acacia Ridge (A004690321), currently operating as the BMI Resource Recovery facility, has been advertised. I am pleased to advise that work will commence shortly on the installation of shade sails at E C Backwell Park, Kalang Street, Archerfield. It’s time to have your say on Council’s newly released Draft Master Plan for the Oxley Creek Transformation. This Plan is part of Council’s $100 million 20-year project to transform and revitalize Oxley Creek. 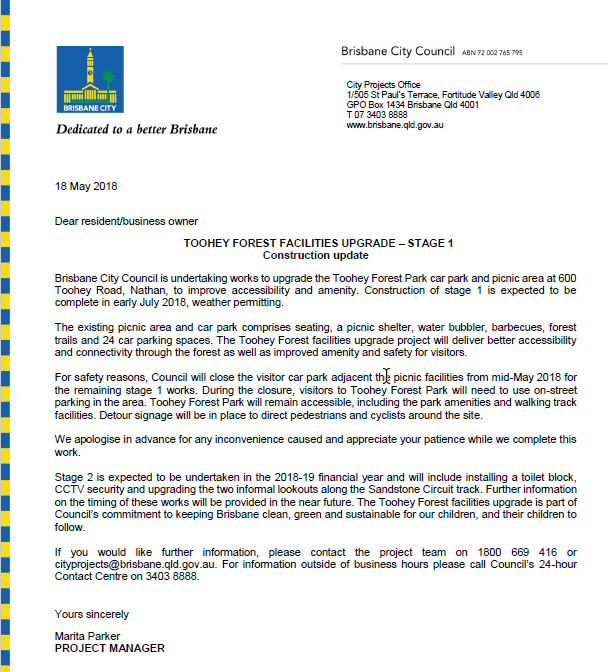 I am pleased to advise that works are currently underway to improve accessibility and amenity at the Toohey Forest Picnic Area.